BY COLE NOWLIN “A friendly desert community where the sun is hot, the moon is beautiful, and mysterious lights pass overhead while we all pretend to sleep. Welcome to Night Vale.” Thus begins the pilot episode of Welcome To Night Vale, the most delightfully bizarre podcast out right now, a wonky blend of Twin Peaks and The Twilight Zone with a sinister Lovecraftian bent to it. It is also enormously popular, with more than half a million subscribers on Soundcloud. The premise of the show is a faux-community radio broadcast hosted by Cecil Baldwin, whose silky baritone lends narration of all the weird doings in the fictional town of Night Vale the ring of plausibility no matter how out-there they are. Weather report? Partly sunny with a chance of apocalypse. Sports? Michael Sandero, quarterback for the Night Vale High Scorpions, has really been playing well since he was struck by a sentient lightning bolt which seems to have given him superpowers. Citizens are warned against talking to the mysterious hooded figures that showed up in the dog park because they tell lies. Also they don’t exist. The radio station’s mascot is a cat that can levitate. WTF you say? Exactly. Welcome To Night Vale is like a shattered fun-house mirror held up to small town Americana. The podcast was created by Jeffrey Cranor and Joseph Fink who have concocted something so unique it is difficult to identify any stylistic predecessor or analogous production. Mostly the show skews towards the darkly comedic, sometimes there’s more darkness than comedy. Mostly it’s just plain weird. And curiously popular. What began as a pet project for the creators has become wildly popular, and now Welcome to Night Vale consistently ranks as one of the most popular comedy podcasts on iTunes. 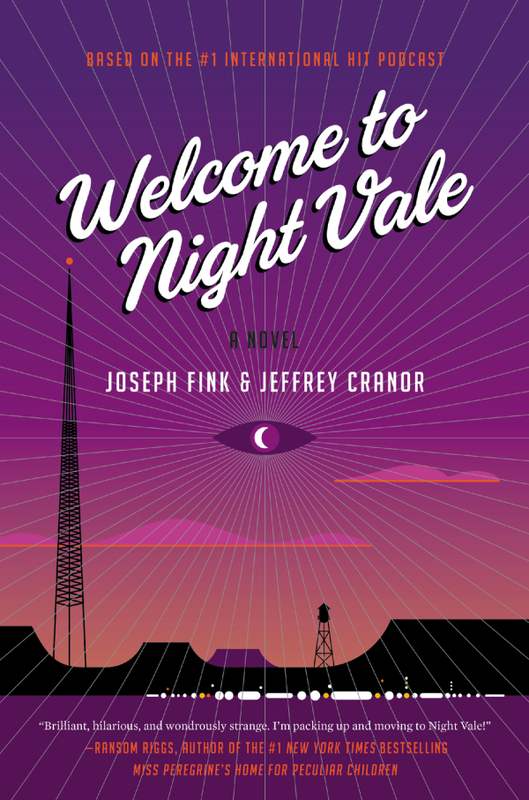 It has become so popular that the Fink and Cranor have just published a novel-ized version of the podcast, told from the perspective of two of the less prominent denizens of Night Vale: Jackie Fierro, the ageless nineteen year old who runs the town pawnshop, and Diane Crayton, a single mother who is desperately trying to connect with Josh, her sullen and withdrawn son. And the fact that he is also a shapeshifter is not helping. Fink and Cranor, the deus in Night Vale‘s ex machina, are currently in the midst of a tour promoting the podcast and the novel that stops in Philadelphia on November 11th as part of the First Person Arts Festival. Let the buyer be weird. This entry was posted on Thursday, November 5th, 2015	at 3:52 am	and is filed under News	. Responses are currently closed, but you can trackback from your own site.